1) Silicon Valley’s first cider house readies the taps according to the San Jose Mercury News. 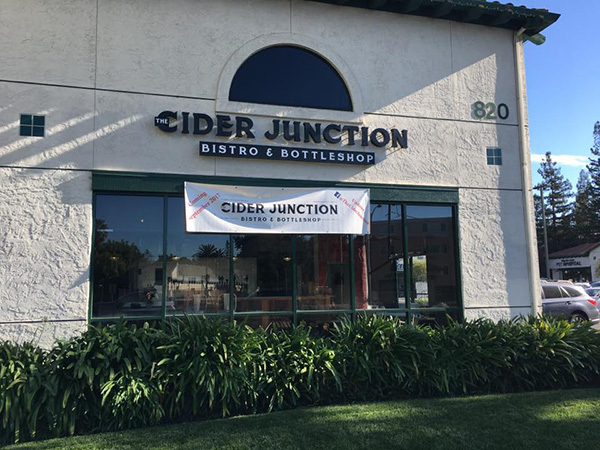 The Cider Junction—a self-described “cider bistro and bottleshop”—features 25+ draft lines, 60+ bottles/cans, and a variety of small plates. 2) Dan Pucci helps GQ select its Ciders You Should Be Drinking This Fall. 3) Cider Culture suggests 5 Hard Cider Cocktails to Try This Fall. And Cidercraft introduces the Vieux Carré de Pomme—its take on the classic New Orleans cocktail. 5) “Without the H-2A program, a successful harvest would not be viable.” The New York Times reports on The Jamaican Apple Pickers of Upstate New York. 6) “What’s it going to take to get you to plant cider apples?” Alejandro del Peral of Nine Pin Cider and Jake Samascott of Samascott Orchards discuss Growing a wider variety of flavors for cider. 7) Good Beer Hunting interviews Louisa Spencer and Steve Wood of Farnum Hill Ciders. And Cider Chat interviews Jérome Dupont of Domaine Dupont. 8) Cidermaker Barny Butterfield details Devon’s rich cider history (and bright future) in Devon cider is back, and it’s better than ever at Sandford Orchards. 10) Along Came a Cider reviews Devoto Orchards Save the Gravenstein. Cider Says reviews 2 Towns Cidre Bouché 2016, Farnum Hill Semi Dry, and Farnum Hill Kingston Black 2015. Cidercraft reviews Bauman’s Fresh Hopped. CiderScene reviews 101 Cider House Black Dog. The Milled Apple reviews Stormalong Mass Appeal and Graft Cider Book of Nomad. Cider Society reviews Sonoma Cider The Wimble. The Cider Inspirer reviews Sandford Orchards Devon Red. The Cider Drinker reviews Brännland Cider Pernilla Perle. And Cider Explorer reviews Dorset Nectar Old Harry Rocks, Manzanova Sidra Ecologica, and Ramborn Farmhouse.